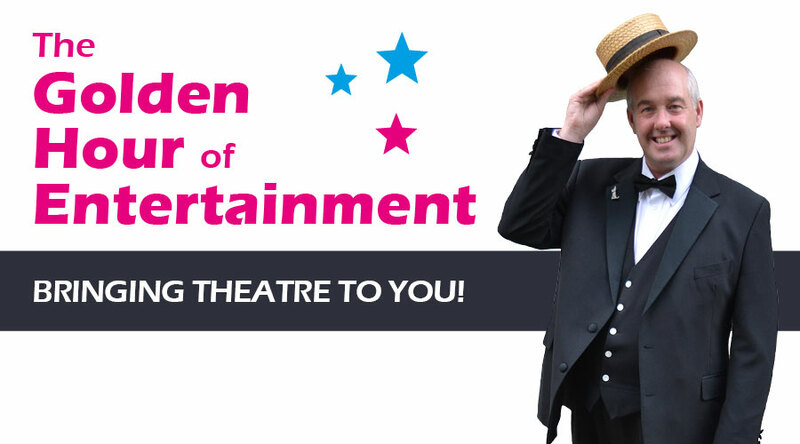 Our Golden Hour of Entertainment, visits Day Centres, Residential Homes for the Elderly, and Retirement organisations. There are 3 different programmes plus a special festive version. There are numerous costume changes throughout, as well as humour and anecdotes about life in the theatre, which triggers even more memories for the audience; either about theatres and shows visited when they were younger, or sometimes indeed about themselves or relatives who have been in showbusiness! The audience can be assured of a great theatrical experience, brought to them...in any venue; each performance being different and can be 'slanted' to appeal to that particular audience, from E.M.I. Clients, to active retirement groups, and every one in between! For special occasions, such as birthdays, Christmas, Summer, or Easter, the show can supplement a performance with other performers and musicians to put together a presentation as big or small as your venue or event requires. These hour long shows are excellent value. For the standard Golden Hour programme, a minimum of 30 minutes set up time is required. For the Festive Specials and those programmes involving other performers and live musicians, longer may be needed, and we would request somewhere to dress, as all these programmes are costumed.